At times “Enter the Dangerous Mind” feels like an extended music video, but, for the most part, that’s okay. Just don’t expect a particularly accurate (or sensitive) portrayal of mental illness. This disturbing and somewhat exploitative psychothriller focuses solely on the most extreme and even deadly mental health crises, the James Holmes’ in a social group of mostly harmless individuals. The story concerns a Paranoid Schizophrenic named Jim (Jake Hoffman, son of actor Dustin,) who makes… noise for a living. Well, technically jarring techno music, but I don’t want to get into semantics here. Jim develops these tunes to ‘drown out the noises in his head,’ but when he tells Wendy (Nikki Reed,) a cute social worker, that, it doesn’t seem to concern her. It should. Jim has a roommate (Thomas Dekker) who is the proverbial devil on his shoulder, urging him to get over his crippling shyness and get laid. Jim begins a tentative relationship with Wendy, but an embarrassing bedroom incident triggers a downward spiral for the disturbed young man. As Jim becomes increasingly delusional, Wendy breaks off all ties with him, leading to horrific consequences for both of them. The plot develops okay up til the silly ending (apparently not only do Schizophrenics kill dogs, murder people, and engage in horrific acts of self-mutilation, their disease is also as contagious as the common cold,) while actor Jake Hoffman does a good job as Jim, making his tics and affectations believable while keeping his character somewhat sympathetic despite the reprehensible things he does. On the other hand, I didn’t like the jerky ‘hard-rock-music-video’ cinematography or the constant, grating electronica score. I don’t like electronic music; I never have, so you can imagine I found the omnipresent pulsing techno to be irksome, to say the least. 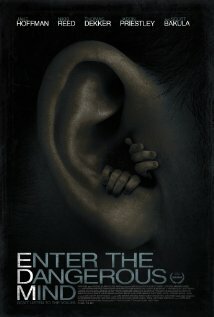 “Enter the Dangerous Mind”‘s commendable performances elevate it infinitesimally above average territory, and while the movie is not politically correct regarding the horrors of mental illness- not by a long shot- it does keep you guessing and capture your attention for it’s short duration. It is similar in subject matter to the recent film “The Voices,” although “The Voices” is the superior film due to it’s visual verve and it’s cheeky sense of humor regarding the portrayal of extreme insanity. Both movies could easily be called “Dating a quirky, weird guy becomes a health hazard when…” Poor Wendy. like Anna Kendrick’s character in “The Voices” believes she can save her troubled beau from himself. But sometimes, girls, being nice and considerate and compassionate to a guy who is batshit crazy just doesn’t cut it anymore. Once in a while a restraining order does what all the kindness in the world can’t. 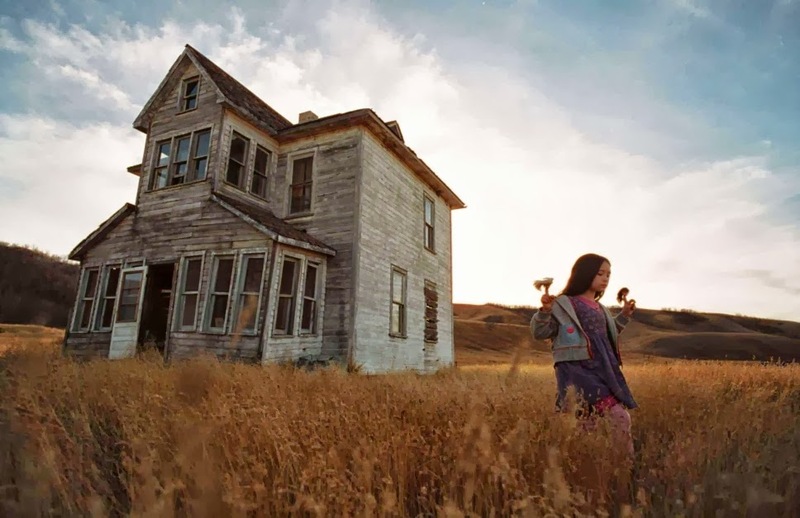 “Tideland,” Terry Gilliam’s fantastical horror brain child, is an undeniably original, unmistakably repulsive journey into the life and mind of one troubled little girl (Jodelle Ferland.) To say it outstays it’s welcome it an understatement, the film clocks at over two hours and leaves an undeniably bad taste in one’s throat. The characters are hard to comprehend, much less like or understand. All this would be bad enough without the bizarre intro by Terry Gilliam, who vaguely informs us that children ‘bounce back’ from situations such as these and tells us ‘don’t forget to laugh.’ But what is there to laugh at in a disgusting horror show such as this? it’s as if Dave Peltzer of ‘A Child Called It’ fame had promised us a knee-slapping good time. Between the role of Jeff Bridges as the girl’s junkie father, who sits down in a chair to shoot up, dies, and spends the majority of the movie in various states of decomposition, our prepubescent heroine trading ‘silly kisses’ and sexual curiousness with a mentally retarded man (Brendon Fletcher,) and Daddy (prior to his death) instructing his daughter to prepare heroin for him, I found very little to laugh at in this revolting freak show. The fact that Gilliam expects us to laugh and see this whole travesty through the eyes of a child speaks volumes on the man’s mental stability. What does he think we are? Animals. Sub-human cretins who are all-too-eager and willing to laugh at the mental and psychological destruction of a child? Apparently, if Gilliam should have his way, we will be laughing at child endangerment through the eyes of that child, oblivious to the adult consequences of such atrocities. Mmm-kay. Dell, who as it happens, bangs the stuttering grocery delivery boy (Dylan Taylor) in exchange for food, takes a liking to Jeliza-Rose and invites her and her doll heads (Jeliza-Rose frequently talks through her collection of severed doll’s heads, did I mention that?) to live in her and Dickens’ family home. “Tideland” often references Lewis Carroll’s ‘Alice in Wonderland,’ as Jeliza-Rose ‘falls down the rabbit hole’ from one bizarre situation to another. 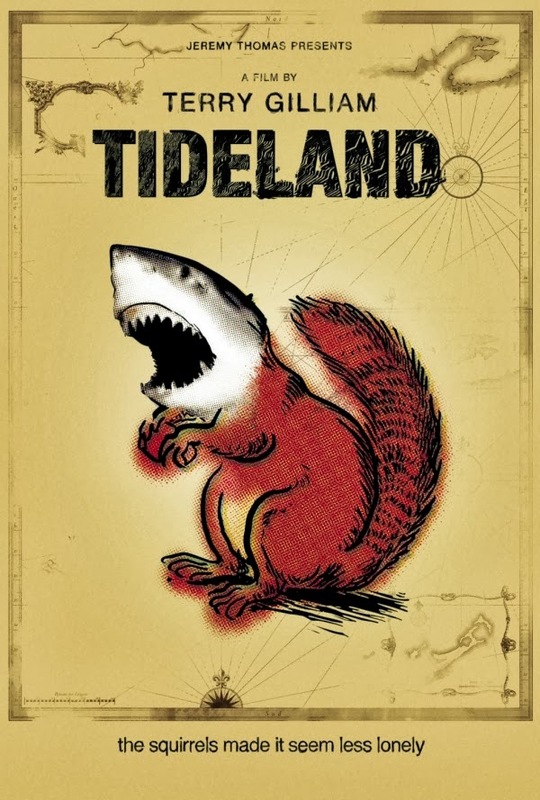 Although technically well-made in many respects, “Tideland” is yucky, overlong, and had me begging for it to end by the halfway point. Jodelle Ferland turns in pretty good performance as Jeliza-Rose (although I found her Southern accent exaggerated) and Brendan Fletcher gives a decent supporting performance as Dickens (who, through no fault of his own, reminded me a bit of Ben Stiller’s ‘Simple Jack’) but overall the film is a fail. I would recommend you watch “Alice” by Jan Svankmajer as a dark take on “Alice in Wonderland” rather than this. It is less sickening and doesn’t make you feel like you’re watching for hours on end, but hey, that’s just me.